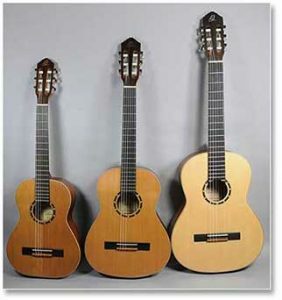 We carry new Classical Guitars from a variety of individual builders and companies, frequently including traditionally built instruments from Spain. We also offer models that include cutaways and pickups. Our primary lines of new classicals are from Alhambra, a well-established builder of classicals in Spain, as well as from Almansa, which are comparable guitars built by the Alhambra company. We also offer quality entry-level instruments from Ortega, including fractional sized (especially 3/4 and 1/2 size) guitars. Also visit our Used & Vintage Classicals page.